Welcome To Gail Abbey Fitness! I have been working at my studio Gail Abbey Fitness passionately for more than 20 years! Being a personal trainer is super rewarding above all being able to help people with a variety of health issues. 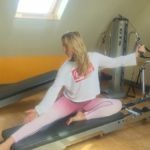 Over the years of personal training we at Gail Abbey Fitness have worked with clients to achieve weight and fat loss goals, injury rehabilitation, pre and post natal pregnancy. Better body tone or flexibility. Post illness rehabilitation. Using methods of training such as yoga, pilates, stability balls, free weights and the amazing unique Gravity total gym training program all help you the client achieve your desired results. through my company SoSpa Fitness and Fun Holidays and SoSpa Corporate Fitness. This enables myself and my team to keep clients motivated all year round. However my clients wanted more! “Can you actually provide us with the food” they asked! and an outside events company! enabling my team to create clean eating hampers delivered direct to you. I don’t ever give up on YOUR goals. Work with me and we will achieve. Keep the exercise programs simple & varied for fun and the best results. Fuel your body with the best food you can as nutrition is of paramount importance. Give us a call, we want to help YOU.